Natural Collection Rosemary and Witch Hazel Face Mask contains anti-bacterial Rosemary and Witch Hazel to really deep-cleanse your pores, drawing out impurities and excess oil, leaving your face feeling totally refreshed. Apply evenly using your fingertips to clean, dry skin avoiding delicate eye and lip areas. Leave for up to five minutes, rinse off with warm water and pat dry. This is quite an inexpensive mask that is great for your skin; the results were that my skin was slightly more soft and supple after use, and my skin really drank the mask and took in all of the moisture, which benifited it. The packaging was quite ineffective as it was difficult to open and use. In addition, I love the effect witch hazel has on you skin and it is definitely one of my favourite things to use for my skin; i love to see witch hazel as an ingredient in masks which is what made me buy this one. However, I don't think the combination of witch hazel and rosmary is very good; it slightly reduced the effects of the witch hazel on my skin and the scent wasn't as pleasant as I had anticipated. I quite liked, not loved, this mask, however, I believe there is definitely better masks out there that will benifit your skin in a much more positive manner; I observed some, not as many as there could have been, results that I liked, such as reduced pores and moisturised skin. Overall, i would recommend this product to those of you who just want a relaxing pamper day with a face mask and are not expecting this mask to completely change their skin, as it really doesn't do that much. Scent, hard to open and get on face, very fiddly. I bought a few of these for a girls night in. Was not keen on the scent and was fiddly to open. Skin did not feel much different after use. 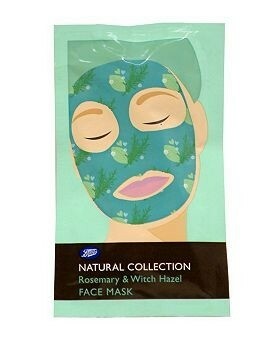 Not bad but better face masks out there. Not keen on scent and packaging!